The beauty of the land that John Bidwell encountered led him to establish Rancho Chico and later donate eight acres of orchard land for the Normal School that is now California State University, Chico. As Chico State celebrates 125 years of service as a distinguished institution of higher education, its beautiful campus and its buildings remain a source of pride and enjoyment for all who study, work, and live here. Meriam Library honors both a father and son: Morrison E. Meriam, professor of psychology from 1902 to 1934, and Theodore "Ted" Meriam, community leader, alumnus, and friend of the University, a member of the California State University Board of Trustees from 1961 to 1971, and its chair from 1968 to 1969. Meriam Library Special Collections and University Archives are a unique regional resource of written and pictorial materials which document the historical as well as the contemporary issues of the 12-county region known as "northeastern California," as well as the history of California State University, Chico. Trinity Hall, first known as the Library, was designed by Chester Cole, a Chico architect, and was completed in 1933. It was the third of the buildings designed to replace the original Normal School building which burned in 1927. It is a brick building in Romanesque design with a square bell tower on the south side. The front of the building faces towards the creek. It was planned to hold the library and classrooms. When the new library was built in 1959, it was converted to the Campus Activities Center and housed student government offices, lounges, and a bookstore. Since the 1970s it has housed faculty offices and a museum/art gallery. The name was changed to Trinity Hall in 1972. 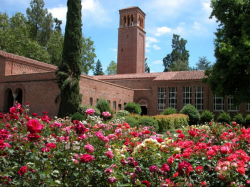 This building -- our home on the Chico State campus -- began as the third heating facility built on Chico State's campus. In response to the increase in college enrollment after World War II, Chico State began a new phase of building construction. The new buildings increased the need for such utilities as heating systems. Built by B and R Construction Company of San Francisco, the approximately 8,000 square foot heating building contained an office, a bathroom, and two steam boilers. Designed by a state architect, the facility used a brick exterior to match the original buildings on campus. Completed in June of 1949, the heating facility was used for twenty-three years. In the mid 1970s, the building was remodeled for office space. A new heating and cooling facility built in 1972 made the boiler plant obsolete. The university's Center for Regional and Continuing Education moved into the building after renovation in the early 1990s and is still there today. The administration building was built on the site of the Normal Building, which burned in 1927. The original cornerstone was incorporated into the building along with a new one. Chester E. Cole designed it in the Romanesque style, to match Laxson Auditorium and Trinity Hall which were built at that period. It is a two-story building with a rotunda in the middle. It is constructed of brick with a Spanish tile roof and decorative columns and arches. Although the exterior has had only minor changes, the interior has been remodeled to contain more offices and the utilities have been upgraded. In 1964 a spiral staircase was added under the dome of the rotunda. There is a central hanging globe in the dome representing the earth. The underside of the dome was created to represent heaven so as you climb the spiral staircase you ascend past the earth towards heaven. The motto "Today Decides Tomorrow" is above the central arch leading into the entrance. The building originally contained offices and classrooms. Over the years the classrooms have moved to other buildings and it is used only for administrative purposes. It was renamed Kendall Hall in 1979 in honor of former President Glenn Kendall. This one-story brick building was completed in the summer of 1921 under the direction of Walter Hann, Chief of Maintenance. Thirty-two thousand dollars had been appropriated by the state for this purpose, and the building was designed by a state engineering architect, H.L. Saterlee, for use by industrial arts students. It was designed as a single story structure with many windows allowing for light and a roof with skylights and a good ventilation system. Since the brick exterior and windows of the original building remain, Colusa Hall is recognized as the oldest building on campus. It has been used over the years for a variety of purposes, most of them related to industrial arts. Its recent transformation focused on designing a state-of-the art conference and event facility that integrates state-of-the-art technologies, stunning design, and the natural and built environments. The project took advantage of sustainable building practices and materials, while maintaining the historic nature of building. Laxson Auditorium was the second structure built to replace the Normal School which burned in 1927. It is built of brick in Romanesque style to match Kendall hall. Called the Auditorium for many years, it was named in 1979 to honor C. Robert Laxson, a music professor at Chico State from 1946 to 1968. The auditorium can accommodate over 1400 people and is used for concerts, plays, and other special events. The Janet Turner Print Gallery was housed on the second floor until its relocation to Meriam Library in 2009. For information on all of CSU, Chico's campus buildings, visit the University website.